Jonny Bairstow will miss England's final two limited-overs matches against Sri Lanka after scans revealed he suffered an ankle ligament injury playing football ahead of the fourth ODI. 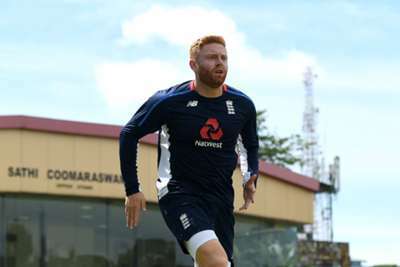 Bairstow was forced to sit out the 18-run Duckworth-Lewis-Stern victory in Kandy on Saturday after he turned on his ankle during England's pre-match warm-up. In his absence England wrapped up the series in another rain-affected match, his replacement Alex Hales only managing 12 at the top of the order. Hales is likely to get another chance on Tuesday, though, with the news that Bairstow will not feature, the wicketkeeper-batsman facing an anxious wait to see if he will be fit enough to feature in the upcoming Test series. "Jonny Bairstow has been ruled out of the fifth ODI and the one-off IT20 against Sri Lanka after scans revealed he has a right ankle ligament injury," the ECB said in a widely reported statement. "He will be monitored and assessed on a daily basis by the England medical team in Sri Lanka and a further update will be given in due course on his fitness ahead of the three-match Test series starting next month." The first Test against Sri Lanka begins on November 6 in Galle, with Kandy and Colombo hosting the other two matches in the series.